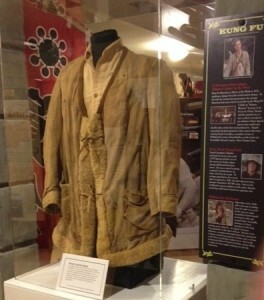 A rare piece of television history was unveiled this past Saturday night at the Martial Arts History Museum: the actual jacket worn by wandering Shaolin monk, Kwai Chang Caine, deftly played by the talented David Carradine in the original ABC-TV series, Kung Fu (1972-1975). In attendance with several members of the Carradine family were actors from various episodes of the original show, including: Radames Pera (young Grasshopper), John Barrymore (Zeke Caine) Doug Wong (original Kung Fu adviser & actor on the pilot episode) and Tatsuo Hirano (also from the pilot episode). Also in the house: David Carradine’s personal Kung Fu master and trainer, Rob Moses of Kung Fu the Legend Continues, along with a gathering of ardent friends and fans who braved serious rain and cold temperatures to honor Carradine’s legacy. In addition to the unveiling, tribute was paid to Carradine who was posthumously inducted into the Museum Hall of Fame for his significant contribution in bringing martial arts to public awareness. 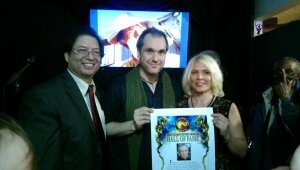 David’s wife, Annie Bierman-Carradine, his son Free and daughter Calista accepted the award. The Martial Arts History Museum's Hall of Fame is considered the martial arts' most prestigious club. Filled with historic and iconic figures, it is the most difficult hall to be a part of for the arts. Carradine was selected as the 2014 induction. The Martial Arts History Museum is located at 2319 W. Magnolia Blvd., Burbank, CA 91506. Website is Mamuseum.com and is a non-profit 501(c)(3) organization. Museum president Michael Matsuda, Free and Calista Carradine.